Current food culture is all about being “Instagram-ready,” or visually-beautiful and interesting. Halo-halo, or haluhalo, is one of the most unique and striking desserts you can get on a hot day thanks to its many layers of colors, textures, and flavors. What is this sweet treat exactly and how do you make it? Cold desserts most likely began in China using fresh snow, and the concept quickly spread to other neighboring countries in Asia. Japan created “kakigori,” which is shaved ice topped with sweet beans. Japanese farmers would make the kakigori with sweetened condensed milk as well. The Philippines adopted the treat, and when Americans brought ice to the country in the mid 1800’s, the dessert became more readily-available. In Tagalog, halo-halo means “mix-mix,” (pronounce it hah-loh, hah-loh) and the add-ins to the shaved ice base are very important. After WWII and the Japanese occupation of the Philippines ended, locals adapted halo-halo based on what they liked. Ube jam, which is purple yam, and yam ice cream are the most significant Filipino additions. During the summertime, everyone wants halo-halo in the Philippines, and you can find it everywhere. Now halo-halo is popular in the United States, but taking the whole “mix in what you like” philosophy too far got food magazine Bon Appetit in a bit of hot water. In 2016, they published “Ode to Halo-Halo,” where they included a recipe that included mashed berries, gummy bears, and popcorn. The comment section blew up with readers calling the modifications “disgusting” and “a desecration.” If a magazine is going to highlight an ethnic dish, why change it so much? This isn’t the first time Bon Appetit disrespected a food; they faced similar backlash just a few months earlier with their feature on pho. So, what does belong in halo-halo? Sweetened condensed milk goes on top. To eat, mix everything together and enjoy! You don’t have to travel as far as the Philippines to get good halo-halo. Any place that makes Filipino food will most likely serve the dessert. 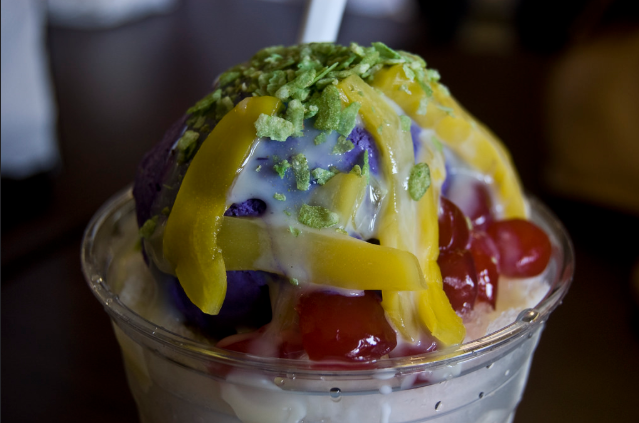 In Chula Vista, CA, there’s Halo Halo Cafe and Ice Cream Parlor, which boasts 4.5 stars. In Portland, Oregon, St. Barbra Pinoy Bakery makes halo-halo complete with ube ice cream. Jollibee, which is a worldwide chain, has US locations in California, Hawaii, Illinois, New York, Nevada, Texas, Virginia, and Florida. If you’re going to make your own halo-halo, you’re free to include whatever toppings you want, but for an authentic experience, you have to include ube of some kind. Rather than make your own ice cream, try out this recipe for “dump-stir ube” from Filipino Kitchen. Pour everything into a big pot and stir it together on a stove set to low. Nothing is actually cooking; some heat will help the melting and mixing process. You should end up with a mixture that’s thick and sticky. Add to your halo-halo! Rolled ice cream is another Asian dessert that’s become very popular stateside. What makes it different than regular ice cream?